We have missed the last few Sketch Tuesday assignments, but this one fit right in with our Apologia Zoology II Swimming Creatures of the Fifth Day curriculum. We had learned about rays and skates in the chapter on Sharks and Rays. These two creatures both have cartilage instead of bones! The cartilage is lighter, and more flexible. Rays have a sharp, spine or stinger filled with venom near the tail. When we visited the Virginia Aquarium a few weeks ago we were able to watch a feeding, and hold our hands down in the tank water to feel the rays’ backs when they swim by. 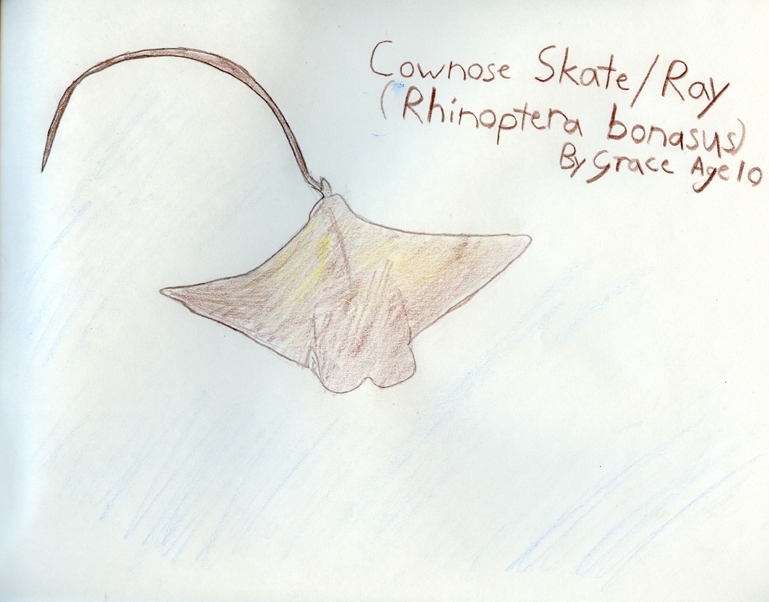 The variety that Grace chose to sketch is a Cownose Skate or Ray that is actually native to the Chesapeake Bay. Two years ago after a big Nor-easter we had a few of these graceful creatures swimming around in the shallows of the river behind our house for several weeks!